Celebrating the life of Theodore R. Foster, Sr.
Obituary for Theodore R. Foster, Sr.
Theodore R. Foster, Sr., son of the late Munford and Luvenia Foster. Theodore was born in Blackstone, VA on November 14, 1933. He departed his life on Monday, November 5, 2018, at the Virginia Commonwealth University Hospital in Richmond, Virginia. Theodore, affectionately known as “Teddy” graduated from Luther H. Foster High School, Nottoway, VA. At an early age he accepted Christ and became a member of Shiloh Baptist Church, Blackstone, VA. After graduation he moved to Baltimore, MD, later in his move he was joined in holy matrimony to Jerue Wright, and from this union they had one son, Theodore Foster, Jr.
After leaving Baltimore he moved to New York, at that time he became a member of Grace Baptist Church, Mount Vernon, NY where he served faithfully on the Usher and the Men’s Ministry. After retirement “Teddy” and his family moved back to Blackstone, VA and rejoined Shiloh Baptist Church. Under the leadership of Rev. 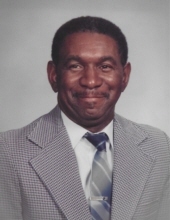 Raleigh Bagley, former Pastor of Shiloh Baptist Church, he was appointed to the Trustee Board, he also served on the Choir Ministry, Usher’s Ministry and Men’s Ministry. Theodore (Teddy) was a father, grandfather, great-grandfather, and a bedrock to many family members and friends. He is survived by his loving wife Jerue; one son, Theodore, Jr. (Shelia); one grandson Eric (Kisha); four grands, Ericka; Johanna, Shaleah and Jernay; four great-grands Portia, Kyshanah, Shadon and Reba; two great-great grands Michael Jr. and James Jr.; god-son Anthony; and a host of relatives and friends. Funeral Services Saturday, November 10, 2018 at 11:00 am at Shiloh Baptist Church, Blackstone. Interment Greenveiw Cemetery, Blackstone. To plant a tree in memory of Theodore R. Foster, Sr., please visit our Tribute Store. "Email Address" would like to share the life celebration of Theodore R. Foster, Sr.. Click on the "link" to go to share a favorite memory or leave a condolence message for the family.